There is much to enjoy amongst the peaks, valleys, and plateaus of the Norwegian mountains both in the winter and in the summertime, but the beauty and serenity can quickly turn dangerous. Even people who have been enjoying the mountains their entire lives have a healthy respect for them and take care to be well prepared for every eventuality. Make sure your training, your knowledge of the area, and your equipment are all equally well suited for the trip. Before you go hiking in the mountains, you should be familiar with elementary mountain safety. Let people know where you are going and when you expect to be there. Consider the weather reports not only where you are going but nearby as well, and keep in mind that conditions might deteriorate. Plan what to do if it gets dark or if the weather gets worse. Should you turn around or can you take a shorter route to a hiking cabin? Any time you’re in an unfamiliar area, you should bring a map and a compass that you actually know how to use. You should also take a mobile phone because even though there are many places in the mountains without mobile coverage, you might get lucky. Don’t leave it behind. 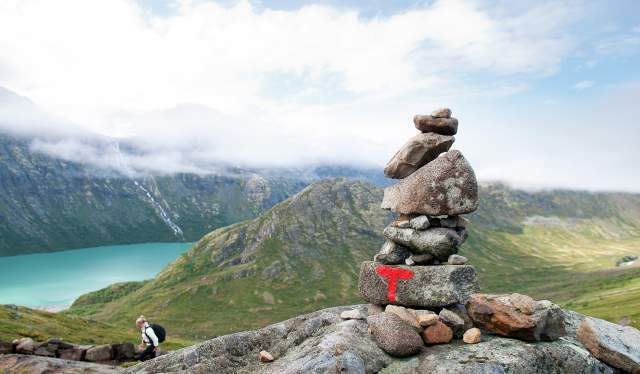 Follow trails that are well marked on the map and pay attention to signs and information boards along the way. If you lose your way, however, be on the lookout for cairns of rocks, which are usually found beside well-established paths. Spaced so that the next one along is within sight, they will guide you back to safety. Remember to bring a torch, a hat, gloves, and an extra set of warm clothes. You should also pack a safety vest. It takes up little space and makes you so much easier to find if you get lost. Stay safe by following these simple rules of thumb. When it’s cold, it’s even more important to dress in layers of wool, not to get wet, and to wear windproof outer garments. In the wintertime, you want to avoid hypothermia. Staying dry helps, as does having enough warm clothing. If you have an accident and need to spend the night, make sure you conserve enough energy to dig a cave in the snow or set up a snow shelter against the wind. Make sure to insulate yourself from the ground or the snow if you have to lie down – skis are great for this, if not exactly comfortable. A large backpack can be used as a small makeshift sleeping bag, and even a small one may keep your feet warm and dry. If you get thirsty, don’t be afraid to eat snow as long as it looks clean and untouched. It will cool you down somewhat, but dehydration will most often be a bigger concern than hypothermia. Even though it’s winter, you should take care to bring sunglasses, as the glare from the snow can be quite intense and cause snow-blindness in extreme cases. If you get lost, stay where you are and wait for help. Stick your skis in the snow, put on your safety vest, and signal with your torch or a signal mirror to make it easier for others to spot where you are. Avoid travelling on and below steep slopes and other avalanche-prone places, particularly if you spot traces of avalanches elsewhere around you. Dry snow avalanches are most common on slopes of 30–45 degrees. Always remember to check the avalanche forecast in advance. You can’t outrun or outski an avalanche, so the best thing to do is avoiding them altogether. Avoid traveling on and below steep slopes and other avalanche-prone places, particularly if you spot traces of avalanches elsewhere around you. Dry snow avalanches are most common on slopes of 30–45 degrees. Always remember to check the avalanche forecast in advance. You can’t outrun or outski an avalanche, so the best thing to do is avoiding them altogether. Thomas T. Kleiven has always prioritised security when he goes skiing. Still, he came close to losing his life when an avalanche overtook him. Every year, Norwegian volunteer rescue crews go into the mountains to retrieve travelers who have lost their way, are tired or injured, or have encountered problems after dark. These travelers are often dressed in everyday clothes and lack suitable equipment. Check out the possibility of joining a guided tour or use a local guide in order to minimize risks. Do not wear jeans, trainers, or other everyday clothing. Do not start your trip too late in the day, as you might risk having to hike in the dark. Do not depend on a map on your mobile device, as there is not always coverage in the mountains. Be prepared and pack your backpack like a pro with our hiking tips. Even in the summer, when the sun is out and warming nicely, you should pay attention to what clothes you wear and bring. Make sure to shield yourself from the sun and to be prepared if the weather turns for the worse. Rain and windproof outerwear is a must, as is woollen underwear, even on warm summer days. The mountain winds can get quite cold, and wool will still insulate you from the cold even when it’s wet, a property it doesn’t share with cotton or nylon fabrics, for instance. Dress in layers so that you can easily regulate your temperature. Jeans and trainers are not suitable for Norwegian mountain hikes. Rain and windproof outerwear is a must, as is woolen underwear, even on warm summer days. The mountain winds can get quite cold, and wool will still insulate you from the cold even when it’s wet, a property it doesn’t share with cotton or nylon fabrics, for instance. Dress in layers so that you can easily regulate your temperature. Jeans and trainers are not suitable for Norwegian mountain hikes. If you get lost, conserve your strength, but remember to eat and drink frequently. Sun, wind, and strenuous physical activity may conspire to make you dehydrated, even if you don’t feel thirsty. Most running water in the mountains of Norway is clean enough to drink, but avoid water running through pastures or runoff from glaciers, as this may contain harmful microorganisms. Remember that certain animals can be dangerous and should best be kept at a wide distance. Polar bears, musk oxen, bears, and moose are all faster than you and can cause harm if frightened, surprised, or if they are defending their young. If you have to be on the move to get help, walk downhill and try to follow creeks or rivers as these will often lead to people. Never venture onto a glacier alone. If you want to go hiking on a glacier, make sure you are accompanied by a certified guide. Campfires in or near forests are prohibited from 15 April to 15 September. Campfires can nevertheless be allowed by the sea or on approved campfire sites. In extreme drought, even grills, gas burners, and camping stoves are prohibited. If you light a campfire or barbecue, you are legally responsible for ensuring that it is safe, does not escape, and is completely extinguished before you leave. In case of fire: Call the fire department on emergency number 110, then try to extinguish the fire yourself. Check the forest fire risk on yr.no. Norway has countless lakes and rivers and an extensive coastline. Get water and boat safety tips, find out what to do if someone falls overboard, and learn about swimming and beach safety.